New York: Brewer, Warren & Putnam, 1932. 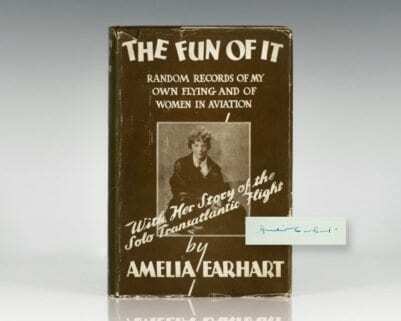 First edition, early printing of Earhart’s account of her childhood, her fascination with aviation, and her life through her 1932 flight across the Atlantic. Octavo, original cloth, illustrated throughout. Signed by Amelia Earhart on the front free endpaper. With the rare original silvertone phonograph recording of her internationally broadcast speech given the day she completed her solo transatlantic flight. In near fine condition with a touch of rubbing. 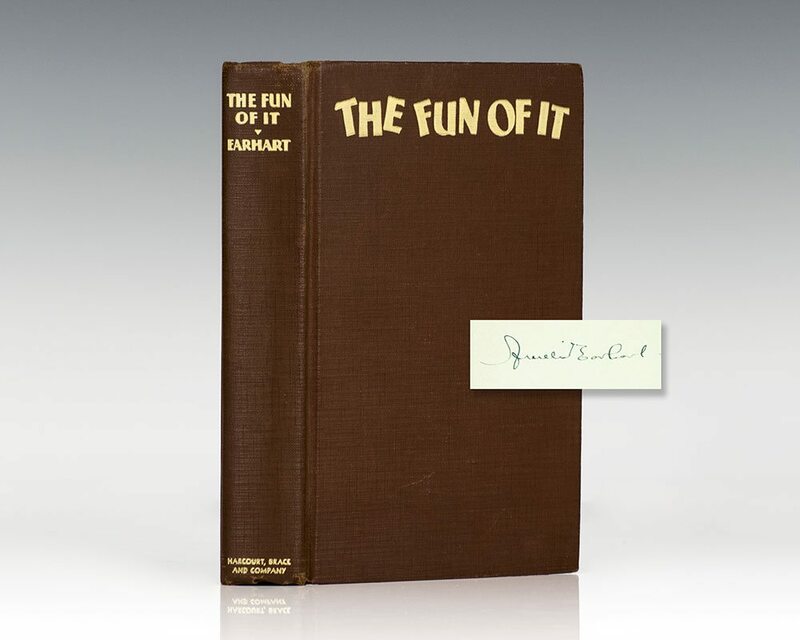 The Fun of It covers Earhart's life through May 20-21, 1932, "when Miss Earhart, alone in a Lockheed Vega monoplane with a single Wasp engine, negotiated 2,026 miles through storm and fog from Harbor Grace, Newfoundland, to a cow pasture on the outskirts of Londonderry, Ireland. The flight set a transatlantic record of 14 hours, 56 minutes… and stirred such public adulation that she confided, 'I'll be glad when the zoo part is over'" (ANB). First edition of Earhart’s account of her childhood, her fascination with aviation, and her life through her 1932 flight across the Atlantic. Octavo, original cloth, illustrated throughout. Signed by Amelia Earhart on the half-title page. With the rare original silvertone phonograph recording of her internationally broadcast speech given the day she completed her solo transatlantic flight. Near fine in a very good dust jacket with light rubbing and wear. 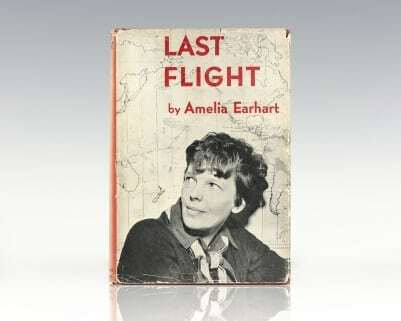 First edition of the chronicle of what turned out to be Earhart’s last flying mission. Octavo, original cloth, cartographic endpapers, illustrated throughout. Arranged by George Palmer Putnam. Contemporary name, near fine in a near fine price-clipped dust jacket with light rubbing and wear. First edition of Earhart’s account of her childhood, her fascination with aviation, and her life through her 1932 flight across the Atlantic. Octavo, original cloth, illustrated throughout. Signed by Amelia Earhart on the front free endpaper. With the rare original silvertone phonograph recording of her internationally broadcast speech given the day she completed her solo transatlantic flight. In near fine condition with light rubbing. Housed in a custom half morocco clamshell box. First editions are uncommon signed. Signed personal check from Amelia Earhart dated December 20, 1932 payable to her husband George Palmer Putnam for $250, which measures 2.5 inches by 7.5 inches. Double-matted and framed with a sheet music cover honoring Earhart. The entire piece measures 12 inches by 18 inches, with a window in the backing for viewing Putnam’s signature. Rare original photograph boldly signed by record-breaking aviator Amelia Earhart. Accompanied by the original typed transmittal letter signed by Amelia Earhart’s husband, George P. Putnam. Addressed to Jean Teal of Murdock, Nebraska, the letter reads: “Dear Jean: Miss Earhart has asked me to answer your note, as she herself is too busy to do much corresponding these days. Herewith we are sending you an autographed picture. The drawing you made she is keeping herself as she would like to add it to her collection. Very truly yours, G. P. Putnam.” Earhart’s husband George P. Putnam achieved fame as one of the most successful promoters of the 1930s particularly with the blockbuster publication of Charles Lindbergh’s autobiography “We” in 1927. He later offered to assist Earhart in writing the story of her flight across the Atlantic ocean which ultimately resulted in the publication of 20 Hrs., 40 Min and their marriage. Double matted and framed. The photograph measures 4.5 by 3.5 inches. The entire piece measures 13 inches by 12 inches.